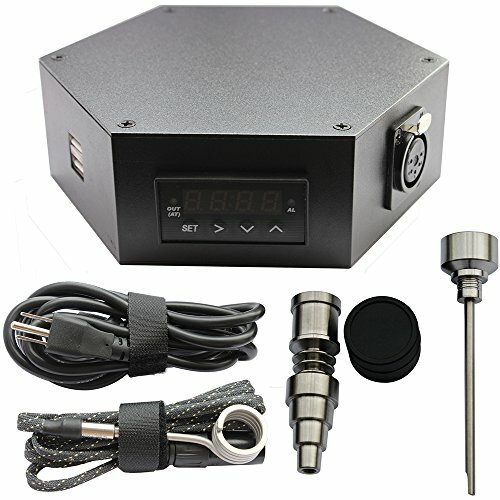 This is Professional Aromatherapy Difuser kit with Pid temperature controler plus accessories Honeycomb shaped high quality auto pid controller ensure you can heat to accurate temperatures and achieve them quickly. Modern shape and look 100 Watt coil heater combined with the controls this unit heats up to the desired temperature. Silicone jar - Great for holding and storage of essential oils. Nothing sticks to it. Titanium Nail - This high quality titanium nail can fit a variety of different rigs. Please keep your eNail away from water or any other liquid or flammables. We promise Free fast shipping within 1-5 days by DHL mail. Full Kit comes with everything pictured, We promise Free fast shipping within 1-5 days!